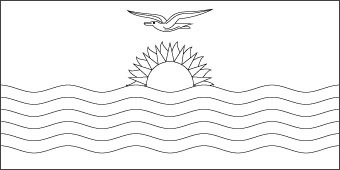 Kiribati flag has a red upper part and in the other half there are three wavy and horizontal lines of alternate white and blue colors . On the upper part, in the middle portion of the flag there is a rising sun with seventeen rays. Over the sun there is a flying frigate bird. The ratio of the width to its length is 1:2. The wavy lines represent the ocean and the group of Guilbert, Phoenix and Line islands while the seventeen rays signify Banaba and other sixteen Guilbert Islands. In 1932 this flag was designed by Sir Arthur Grimble. Location: An equatorial nation of the Pacific Ocean including (Banaba) Island the Gilbert Island (16) 8 of the line Island and the Phoenix Island. National Flag. Red with blue and white wavy lines in base and in the center a gold rising sun and a flying frigate bird. Design and Colors A horizontal bicolor of red with a yellow frigatebird flying over a rising sun with 19 straight and wavy rays; and blue with three horizontal wavy white stripes.